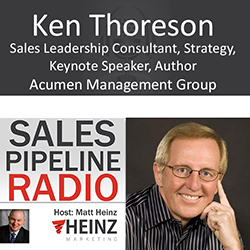 Jim Obermayer sitting in for Matt today with guest, Ken Thoreson, of Acumen Management Group. Their firm is focused on execution, discipline, accountability to the sales organization. SLAMMED: for the first time sales manager. How do you on-board a new sales manager? Within 6 months, new sales managers are usually slammed. Leadership and management skills playing together don't usually get taught. Lifespan of a sales manager is about 18 months.Marketing will go back and write a new plan, but the sales managers get fired. New sales managers seem to focus on micro issues, tracking numbers and activity, and forget they need to have emotional leadership and inspire people to execute. It is the manager's job to instill work ethic, intensity, high levels of performance and interest in creating high levels of results. The sales manager typically will ask, "What are you going to do today? What are your goals for the day?" The stunned sales person stammers a defensive reply, "I'm going to get on the phone...I'm going to call prospects.."
At the end of the day, what determines the level of success you had for the day? On AcumenManagement.com there are a ton of free tools, including, Top 40 actions a sales manager must activate to create predictable revenue." Jim asked Ken,"What is the biggest challenge you see a new sales manager has in the first 2-3 months?" First, you have to set priorities based on the situation. Assume you are walking into a turnaround role - sales are poor...observe, reflect, make a few changes so the team sees that things are getting fixed. Then you go about setting priorities, goals and then expressing your vision of what you want to achieve over the next 90 days to 6 months. Most act too quickly or chew off more than they can achieve. If you are walking into a role where you are replacing someone successful. Then it's sitting back again and understanding the players, building trust first. Ken finds that there is a lot of talk in struggling organizations about "them" and "us" or "those people." There is a line between WE as a team. That line needs to be broken down immediately for the vision, direction and belief of where you are going. This is building culture. Listen to the full episode to get more insights.